The New Uni-Vest™ (short) Professional Weighted Vest UNDER-VEST™ (short) Weighted Liner for Uni-Vest™ Flex-Metal® additional weights kits to double the weight of each of the 52 pockets. The New Uni-Vest™ (short) Super Max-System allows you to quickly switch between high and low loading without removing individual weights. The layered design, for example, lets you put on one layer for running and two layers for pushups. It is easy to put on and take off even at the maximum loading. Start with the thin basic Uni-Vest™ (short) and build your way up with the right weight vest at every stage. The New Uni-Vest™ (short) Super Max-System allows you to work out with 2 to 56 pounds and then quickly shed a layer and continue to work out with the basic New Uni-Vest™ (short) set from 2 to 28 pounds. No other weighted vest system gives you the comfort, ease, and flexibility of the Patented New System. 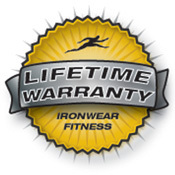 The UNDER-VEST™ patented new design from Ironwear makes it possible to double the weight of your existing Uni-Vest™. The New UNDER-VEST™ is a padded liner that fits under and connects to your Uni-Vest™ and has pockets for additional Flex-Metal® weights. The New Uni-Vest™ (short) Super Max-System is safer and simpler to put on and take off than other heavily weighted vests. Put the weight on or detach the flaps and remove it in layers. 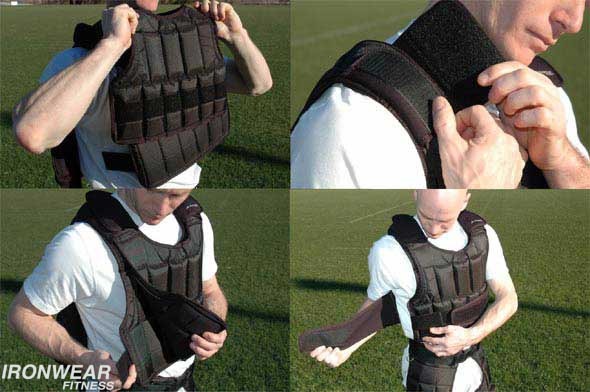 The system uses IRONWEAR®'s 1/2 pound Soft Flex-Metal® Weights and is supplied with 52 weights and the shells for the Uni-Vest™ and UNDER-VEST™, which weigh 2 pounds each. Weights fit into IRONWEAR®'s unique stretch pockets which holds the weight securely on all sides. The soft rubber weights are evenly distributed over the vest. The New Uni-Vest™ (short) Super Max-System fits tighter and provides more comfort than any other vest system. The Soft Flex-Metal® weights conform to the shape of your body and become one with your body. In case of a fall, the weights protect against the impact. The proprietary oversized overlapping elastic strapping system holds the vest securely to almost any size torso while allowing for expansion and contraction of the chest during rigorous exercise. The new Double-lock™ system on the inside of the belt prevent the vest from shifting under the belts. The New Uni-Vest™ (short) Super Max-System has a heavy padded ballistic Nylon shell for maximum durability and soft fabric covered double stitched edges for comfort. The shoulder straps are strong and flexible to allow for a full range of motion. 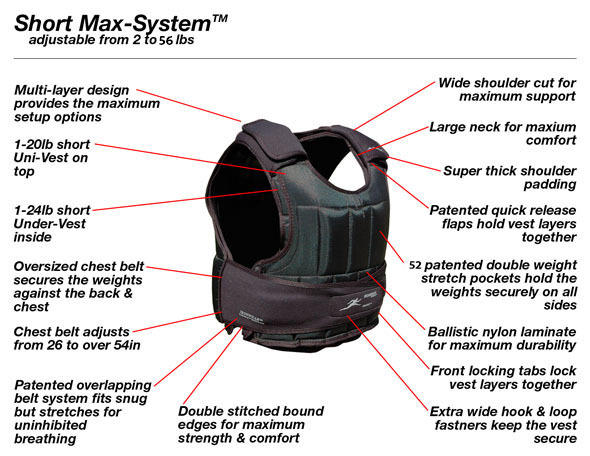 The New Uni-Vest™ (short) Super Max-System shells are the most durable in the industry and are also covered by our factory materials and workmanship lifetime warranty. In the unlikely case that you wear out or damage your vest shell, we offer special deals for new shells at a fraction of a new system cost.